Mysuru: A 29-year-old woman and her seven-year-old daughter reportedly committed suicide by jumping into the Kukkarahalli Lake in city. The incident came to light last evening when a few walkers noticed the bodies floating in the lake. Both the mother and daughter were found missing from their house on Wednesday. The deceased have been identified as Spoorthy and her daughter Hemani. Spoorthy’s parents have now complained that their son-in-law Yogananda killed their daughter and granddaughter and threw their bodies into the lake. Yogananda has been arrested and investigation is on. Yogananda had lodged a complaint at Kuvempunagar Police Station on Wednesday that his wife and daughter were missing. Spoorthy left her house on Wednesday evening to bring back her daughter from school but did not return, he has stated in the complaint. Following the complaint, the Kuvempunagar Police had sent the photographs of the mother and child to all Police Stations. Yesterday evening, some walkers spotted the body of a woman and a child floating at Kukkarahalli Lake and informed Jayalakshmipuram Police Station who in-turn reported the incident to Kuvempunagar Police Station. A Police team rushed to the spot and identified Spoorthy and Hemani as they had the photographs that was given by Yogananda while lodging a missing complaint. According to the police, Spoorthy took the extreme step due to a family dispute. Police said that Spoorthy hails from Chikkamagaluru. A year ago, she married Yogananda, a resident of Mysuru, after her first husband died due to ill health. Hemani was born to her first husband and according to Spoorthy’s parents, all the issues were discussed during their marriage. As Spoorthy had lost her husband at a young age, her parents decided to get her married. The alliance with Yogananda was finalised as he too was a divorcee and had a child. Both the families met and the marriage was solemnised at a temple in Chikkamagaluru on Feb. 28 last year, Spoorthy’s parents said. Spoorthy’s mother Prabhavathi has alleged that Yogananda had killed her daughter and granddaughter as he never cared for their well-being. Yogananda worked as an agent for a drip irrigation firm with a private agricultural firm and had planned a foreign trip on Aug. 18. 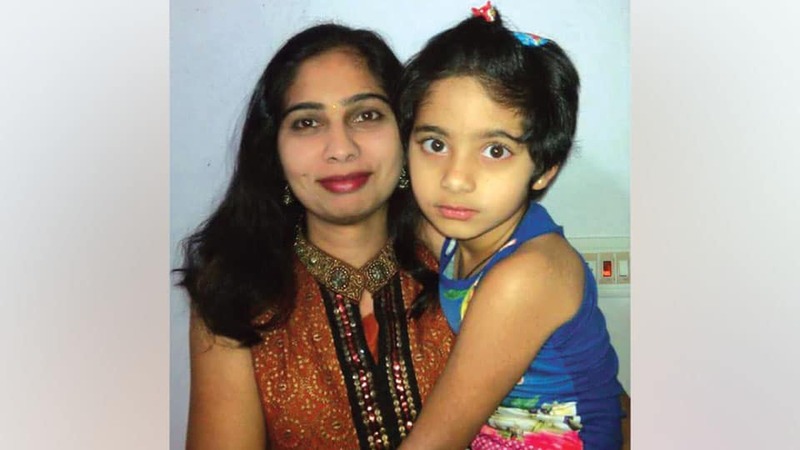 “My daughter was tortured physically and mentally for dowry and he pestered her to buy a site in his name in Mysuru. Many times we had tried to broker peace between the couple and still he used to torture my daughter and she used to constantly narrate this over phone to me,” Prabhavathi said. She said that Spoorthy used to bear day-to-day harassment by Yogananda and added that his sisters too used to harass her for money and house site. “Life had become miserable to my daughter,” she said unable to hold back tears. Prabhavathi said that on Wednesday night, Yogananda called her and told her that Spoorthy and her daughter were missing from the house. “Shocked by this, we started from Chikkamagaluru on that night itself and informed the Kuvempunagar Police Station. My daughter is dead and I have lost my granddaughter too who was a brilliant student,” she wailed, demanding stringent punishment to Yogananda. HEART BREAKING , FEEL SORRY FOR THE PARENTS AT THIS AGE HAVE TO BEAR THIS .